A 2,000-year-old ritual bath used by thousands of Jews for Festivals and other occasions has been uncovered just 20 meters from the Western Wall. 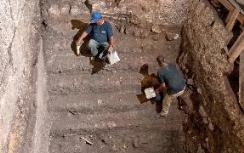 A 2,000-year-old mikveh (ritual bath) has been uncovered just 20 meters from the Western Wall. Given its location just outside the Holy Temple - where untold numbers of Jews regularly immersed before entering - the newly-revealed pool is among the largest ever discovered in Jerusalem. The mikveh was found at the site known as the Western Wall Tunnels, which has long been under excavation and study by the Israel Antiquities Authority, with the support of the Western Wall Heritage Foundation. It is located about 30 meters past the entrance to the Tunnels, in the general direction of the Western Wall. Once it becomes open to the public, the 11 broad steps leading down to the mikveh will be seen approximately 8 meters below floor level. Josephus, the famous turncoat general and historian of the period, wrote that the administrative and governmental center of Jerusalem was located at the foot of the Temple, and that among the buildings there were the National Council and the Lishkat HaGazit, Chamber of Hewn Stone, where the Sanhedrin – Israel’s Supreme Court – convened. The archaeologists feel that it is possible that the luxurious hall aside the mikveh was originally one of these structures. Parts of the mikveh had been uncovered in the past, but now another hall – one of three – has been revealed. The structure was built of smooth stone hewn in a particularly intricate manner, with high-quality decorations and architectural style. Its importance can be determined by the fact that it is similar to other luxurious structures built by King Herod such as the Temple Mount, the Machpelah Cave, and one in Elonei Mamreh.